EPF Online Transfer Claim August 2018 – www.epfoscheme.in provides you all the latest updates, step by step ways and direct links from which you can do EPF online transfer claim through Online Transfer Claim Portal (OTCP). EPFO introduces a new system to facilitate online submission of transfer claims by Members with an objective to make the transfer process transparent, efficient and comfortable for your employees. A member has an option to submit his claim either through his present employer or the previous one. 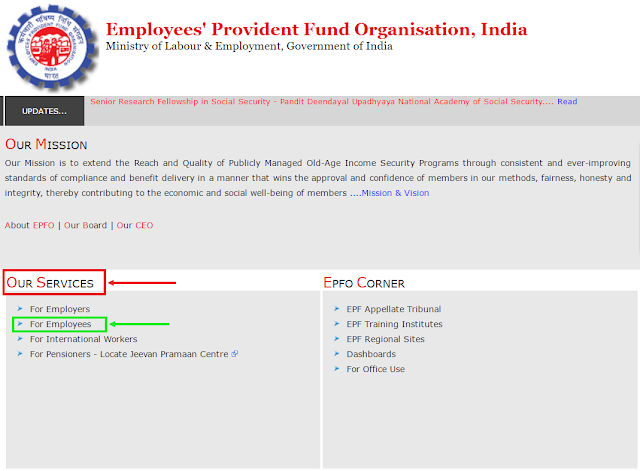 Also Read: How to transfer EPF online using EPF Unified portal? The employer should have registered the digital signatures with EPFO. ► Now at the bottom left corner, you will see a section named “Our Services”, Inside this section, you will see a link “FOR EMPLOYEES” as shown in the fig. below. 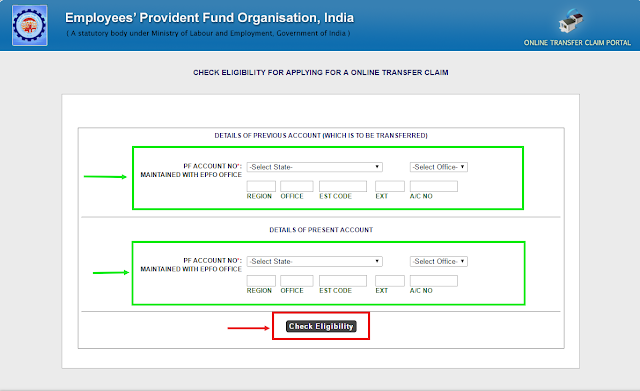 ► Now click onto the “Check Eligibility for Filing Online Transfer Claim”. ► Now hit “Check Eligibility” button. ► In this section, there are two different options. “Click here to Register” It will lead you to the registration Member Portal. 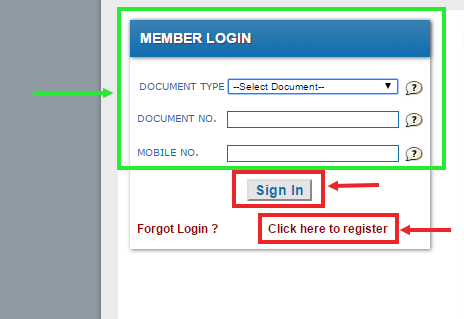 ► Visitors who already registered with this can click on “Click here to Login” available on the eligibility result screen. ► You may directly visit OTC Portal at the end of this page. Step 1 ☞ Visitors must go the OTCP portal and make themselves login by entering KYC document details. Step 2 ☞ When you successfully logged in to the portal, on the page you’ll see a link named “Request for Transfer of EPF Account” under the CLAIM menu. Step 4 ☞ Now, when you finally filled in the “Section A” for the personal details and the “Section B” for previous EPF account details, It’s time to fill in the “Section C” for current EPF account details. Note: All three sections mentioned above are the parts under the Form/Application. Step 5 ☞ When you filled in the required field of all three sections, Now its time to submit it to the present employer or to your previous employer. Step 6 ☞ Now at the next page you have to complete the CAPTCHA by entering the code, after that click on “Get PIN”. The generated PIN will be then sent to your registered mobile number. Step 7 ☞ Enter the PIN number and click on SUBMIT. ► Go to the official portal and click on the “CLAIM” under the main menu section. ► Now follow the steps on that page and take a printout of the FORM-13. ► Next step is to submit the hard copy/printout to your Previous Employer or Present Employer. ► Keep this in mind that the form you need to submit must be duly signed by you. The maximum time to submit the claim is less than 15 days but try to submit it as soon as possible. Note: The employer can reject your claim application after exceeding the time limit of 15 days. ► In the online transfer claim procedure, the employer may approve or reject your request. The time period of 15 days to submit the online claim transfer form to the previous or present employer is exceeded. The given records mismatched with the company database. If you like this article on www.epfoscheme.in sharing this would be much helpful or if you have any suggestions or queries, leave your comment below and let us know more about your needs. we’ll resolve or answer your words soon. BOOKMARK US so you can directly jump into our portal to get the latest updates on such topics like ✓ UAN Registration ✓ UAN Registration Login ✓ UAN Registration Status ✓ EPF Registration ✓ EPFO Member Login ✓ UAN activation ✓ EPF Passbook ✓ UAN member portal ✓ UAN Status ✓ EPF UAN Login ✓ EPFO member portal ✓ UAN portal ✓ UAN Number ✓ UAN Login and much more. Govt. Can Increase The Pension Of EPFO Subscribers – Know How !